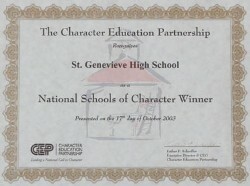 In October 2003, St. Genevieve was the first high school in California - and the first Catholic school in the nation - to be named a "National School of Character" by the Character Education Partnership in Washington, D.C. Faculty and staff flew to the nation's capitol to accept the prestigious honor on behalf of the entire school community. On November 2, 2003, we held an award ceremony here on our campus. It was the grandest celebration in the history of our school. Michael Josephson from Character Counts was here to make the presentation of the award. Additionally, we were honored with speeches by state Senator Richard Alarcon, a former Valiant, Bishop Gerald Wilkerson, and our keynote address was from Mrs. Beth Nimmo. Mrs. Nimmo is the mother of Rachel Scott, the first student murdered at Columbine High School. Mrs. Nimmo reminded us all of the great need to ensure that character education is a part of every school community. For every guest who honored us with their presence that November day, it is one that none of us will ever forget. In 2004, our school received the "Steve Allen Award" for educational excellence and community outreach from the Economic Alliance of the San Fernando Valley. The award recognizes outstanding schools, educators or students who have brought national attention to the region. The award is named for long-time Valley resident and legendary entertainer Steve Allen, who valued learning and spent much of his later years focused on speaking and writing about he importance of education. 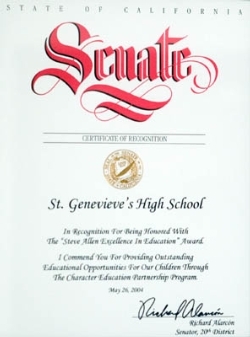 St. Genevieve High School was honored to be included in a national study titled "Integrating Excellence and Ethics for Success in School, Work, and Beyond" conducted by Thomas Lickona, Ph.D. and Matthew Davidson, Ph.D. There is national consensus regarding the need for character - doing our best work, doing the right thing, living a life of purpose. Smart & Good High Schools educate for character - both performance character and moral character. St. Genevieve is honored to have some of our successful strategies outlined in this study. Additionally, two graduates sat on the national panel of advisors to the study. They are: Michael Linares and Katrina Galang. Taking the lead is more challenging than ever in today's world. Good leaders are hard to find and great leaders have almost disappeared from the landscape. At St. Gen's, we are working diligently to inspire leadership in our students. Our goal is for every graduate of St. Genevieve High School to know that when they accept their diploma, they are accepting the challenge to help make our world a better place to live.